Arrive at Vancouver International Airport and transfer independently to your centrally-located hotel. Pick up your information kit at the front desk upon check in. The remainder of the day is at leisure to explore this beautiful oceanside city. Overnight in Vancouver. Embark on a fascinating tour of Vancouver today featuring some of its most famous attractions. An experienced guide will take you over the majestic Lion’s Gate Bridge to the Capilano Fish Hatchery, where you will learn about salmon spawning before visiting the Rain Forest Park. Enjoy the Skyride to Grouse Mountain where you will see lumber jack shows, grizzly bears and birds of prey in the summer months; figure skating, sleigh rides and snowshoeing in the winter. Afterwards, continue on to the Capilano Suspension Bridge suspended high above a magnificent canyon. See traditional totem carvers, a nature park, visit a historic interpretation centre and take a short discovery walk through the old-growth forest on suspended walkways on the unique Tree Top Adventure. Overnight in Vancouver. Today you check out of your hotel and are transferred to the train station and embark on an unforgettable journey, onboard the Rocky Mountaineer, through the majestic landscape of Western Canada. Travel on the pioneer trail, listen to the history and legends of the West and enjoy the excellent RedLeaf service. The train crosses the Coastal Mountains into the rugged beauty of the interior and follows the rushing torrents of the Fraser and Thompson Rivers. Overnight in Kamloops. Breakfast and lunch included. This morning you are transferred to the helipad and embark on the most action packed twelve minutes of a lifetime. Get up close and personal with the world famous Three Sisters. You will want to reach out and touch them as you whisk by them before escaping into the Spray Valley where you will explore the extraordinary hues of the Spray Lakes. Your return flight takes you along the goat range before following the pristine Bow river back to Canmore. Overnight in Banff. This morning depart Banff on your sightseeing transfer to Lake Louise. The tour travels along the Bow Valley Parkway to Johnston Canyon. Other places of interest along the route are the Moraine Lake in the Valley of the Ten Peaks, the Great Divide into Yoho National Park, scenic Kicking Horse Pass, Takakkaw Falls and the magnificent Yoho Valley. Arriving in Lake Louise, you check in for your one-night stay. Overnight in Lake Louise. Travel from Lake Louise to Jasper today by coach with a guide and learn all about the famous local characters that made their mark on one of the “World’s most spectacular mountain highways”. Your trip will allow opportunities for mountain wildlife viewing and visits to scenic viewpoints. At the Columbia Icefield, enjoy a 90-minute glacier adventure on a unique Ice Explorer. Continue on to Jasper where you check in for your one-night stay. Overnight in Jasper. Today you are transferred to the rail station and board the Rocky Mountaineer train for your journey to Quesnel. Travel past the peak of Mount Robson then along the northern arm of the Fraser River leading through the Rocky Mountains and before arriving in the small town of Quesnel, a major pulp and paper centre along the Cariboo Highway. After transferring to your hotel, the rest of the day is at leisure. Overnight in Quesnel. Breakfast and lunch included. Today you depart Quesnel and travel through the deep clefts and hidden passages of the Rocky Mountains to arrive in the resort village of Whistler where you check in for your two-night stay. Overnight in Whistler. Breakfast and lunch included. The clear mountain air beckons you to explore this natural outdoor playground. Hike along endless trails and high alpine meadows, or just relax in the enchanting setting of the pedestrian village and enjoy the boutiques, restaurants and cafés. Overnight in Whistler. 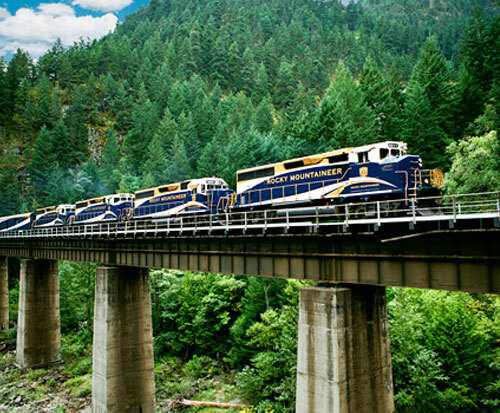 Today you transfer to the station and travel along the Sea-to- Sky Climb route on board the Rocky Mountaineer for your journey to Vancouver. Travelling through the mountain passes on your return trip to the coast is no less breathtaking a second time. Arriving in Vancouver, you transfer to your downtown hotel and check in for your one-night stay. Overnight in Vancouver.